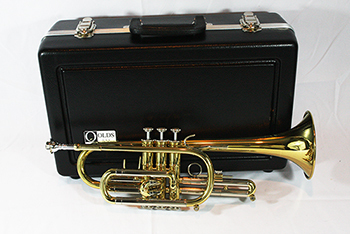 The Olds NA5MU is a cornet designed for the student level. Features such as the brass lacquer finish, .460 bore, 5" bell and 1st slide thumb saddle make this cornet a great beginner instrument. F. E. Olds has long been known for its brass instruments. A molded plastic case and 7C mouthpiece complete this outfit. Here's your chance to own a great cornet at a fantastic price. With a 32% savings it won't last long.